I guess I was in a training from the early age. Now I can’t cook if I don’t have at least 1 herb. I love going out on balcony and touching the rosemary bush. Even a single stroke over it’s leaves will perfume my hands. Rosemary is a powerful plant with many health beneficial properties. Did you know that rosemary is a natural painkiller? It helps you against headaches, combats nausea, it improves the gastric response and promotes the well-being of the stomach and liver. Not only that it will help you combat tiredness, but as an awesome natural remedy it will help you combat depression as well. In Italy we use rosemary for many preparations especially meat, fish, potatoes and focaccia. 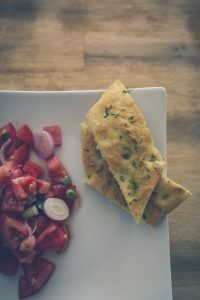 To prepare Focaccia you can use basic pizza dough recipe. 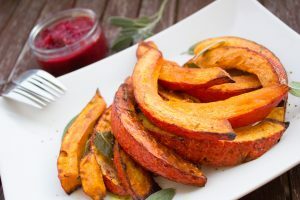 However, instead garnishing it with tomato sauce and your favorite toppings, just add rosemary leaves and coarse salt. To make it moist whisk the water and olive oil and give it a good go. Then press the dough with your fingers, creating dents and bake it in oven till brown. Slice it and eat with your fingers. If I’m making fish in the oven I would put it on the bottom of the pan as a aromatic herbs bed and if I’m grilling the fish, I use the branches to dip in oil and spread it all over the fish. What’s the first thing that comes to your mind when you think about basil? 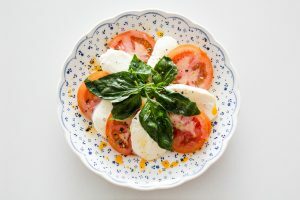 I think about its aromatic flavor on my favorite Caprese salad. I can eat it every day and I don’t get tired of it. Used since ancient times against indigestion, this cheerful plant with intense scent combats inflammation of the oral cavity. I love these gentle leaves rich in iron, phosphorus and magnesium. Did you know that basil helps the health of the bones and the balance of the immune system? It is also powerful diuretic and sedative. You can make an infusion with basil leaves and hot water and you will get a great digestive drink that will help counteract anxiety and stress. 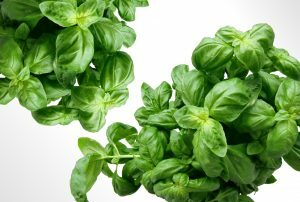 Don’t cook basil in your meals, but add them on the end. 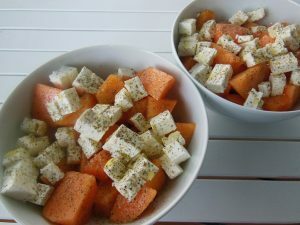 Use it fresh in salads and fresh cheese add to sauces at the end of the cooking time. Prepare fresh Pesto Genovese from basil and pinoli. This is another herb I could I add like crazy to all my meals. I love the fragrance and the aroma. 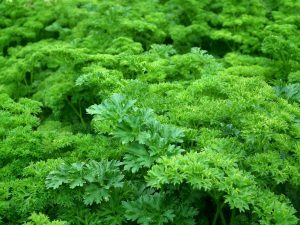 Parsley is rich in phosphorus, copper, iron, sulfur, calcium, vitamin A, C, E.
If you have problem with water retention, you can use parsley as natural diuretic. You can prepare a tea from it to remove excess water from your body. Parsley favors digestion and has beneficial effects on fatigue and anemia. You can use it to reduce blood pressure. It has a super powers of acting against free radicals by detoxing our bodies and it is also a powerful antioxidant. Since I use quite a lot of parsley throughout the year I plant it on the balcony during the warm months. I also make sure that I keep my stock for the winter time buy washing and cutting the leaves and freezing them. I use it when ever I cook as they keep their aroma even frozen. Add to a pot half a liter of water and bring it to boiling. When the water reaches boiling point, add 2 tablespoons of fresh parsley and let the sit in boiling water for 3 to 5 minutes. Remove the leaves of the parsley, and let the tea cool down. You can drink parsley tea both warm and chilled. Feel free to drink it during the day but avoid evenings as this tea has a diuretic properties and will make you go to the toilet often. When smell dry oregano first thing that comes to my mind is pizza. I personally use it in dry form. It is rich in iron mineral salts, omega 3 fatty acids, vitamin A and C, calcium, iron, and manganese. You can use it as a remedy against cough, headache and stomach problems. 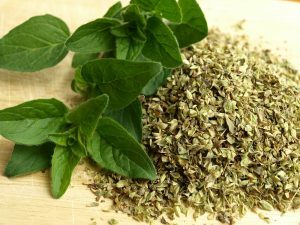 Oregano possesses analgesic properties, in addition to promoting blood circulation by combating cellulite. Thanks to its properties, it can also be used on the most sensitive skin, suffering from psoriasis, eczema or various skin rashes. In the kitchen you can add it to your dishes. It will contribute with an intense taste and beneficial effects to the health of the body. Did you know that in ancient times sage was called a plant of immortality? People believed that with it you can resurrect the dead. It was used for the preparation of magical potions. 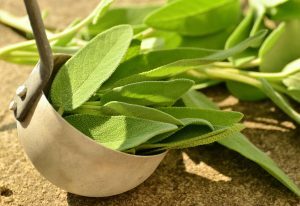 Sage has a scent that delights the taste buds, but it is also rich in important nutrients. Scientific studies have highlighted sage properties for memory enhancement. In clinical studies sage is used in Alzheimer’s cases. Today it is a valuable help against menstrual pain and water retention. I use is as a tea for gargling when I have sore through. The tea has a very bitter taste but it helps a lot by calming down the inflammation. I love to use sage in many forms. When preparing simple sauce for tortellini I would take 3-4 leaves and cube of butter. As soon as the butter is melted I would add a sprinkle of salt and let the sage get browned. I also like fried sage leaves or pesto made from sage and almonds. You can use sage when preparing meat or veggies. 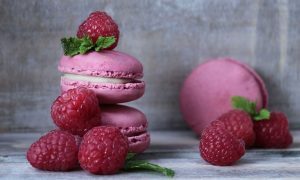 It’s aroma resists the high temperatures and you can nibble it once cooked. Did you know that marjoram and oregano come from the same aromatic herbs group? 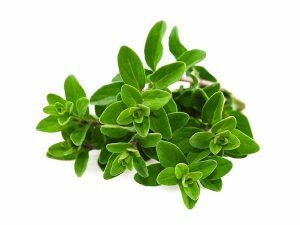 However, marjoram leaves have a more spicy and sweet flavor than the common oregano. I prefer to use it in salads, to aromatize cheeses, meats and sauces. 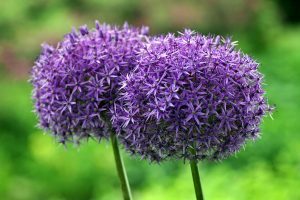 You can grow it easily in the garden or on the balcony. 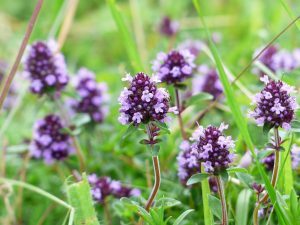 You can use marjoram to prepare essential oil (few drops, without exaggerating, under the tongue) for a deep and immediate relaxation by adjusting the levels of adrenaline and serotonin. of alcohol, then massage on sore areas. Delicious help in the kitchen, the marjoram gives aroma to soups, sauces and legumes. Perfect to add even at the last moment, helps digestion by exalting the flavors. Did you know that even in ancient Egypt thyme honey was known and appreciated for its beneficial virtues. In addition, the infusion was used to disinfect the wounds. It will help you with colds, coughs and bronchitis due to balmy and fluid action. When cooking thyme is great for flavoring meats and fish. 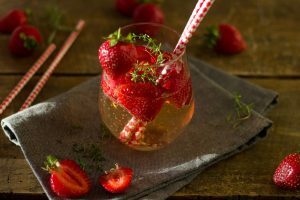 You can also use it in your favorite Gin Tonic, just add some strawberries and fresh thyme. Or in tagliatelle with mushrooms or in simple frittata. Did you know that laurel can help you sinusitis? In ancient times laurel was a symbol of glory and wisdom. Thanks to the its vitamin C content, you can prepare infusions to remove the flu and symptoms of fatigue. You can pick the laurel leaves and leave them to dry and store them in a paper bag or vase to keep in the pantry. Laurel is perfect for flavoring meat, sauces and when cooking legumes. If I’m cooking dry beans I add 1-2 dry leaves of laurel during the cooking. It will help you with digestion and less bloating and intestinal gas production. In addition, thanks to the tannin substances of the laurel, it contributes to the well-being of the body by acting on blood sugar levels and helping to counteract diabetes. Did you know that garlic has beautiful flowers? Garlic is in a way medicinal plant with anti-tumor properties. Thanks to allicin, garlic has a properties of a natural antibiotic. Numerous medical have highlighted the beneficial effects of garlic on the immune system. That’s not all, it’s been proven to have positive effects on the heart and liver health. Rich in minerals, vitamins, amino acids, enzymes, proteins, garlic regulates blood pressure, and as an antioxidant helps detoxify the body. Choose local garlic and bring it to the table daily, raw or cooked. Start cultivating it in the garden or in some jars on the balcony. 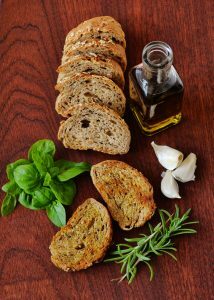 I use garlic in so many ways, raw when I’m preparing bruschetta’s (I use is to rub it all over the toasted bread) or when I’m making my special oven mix of veggies. I like it also in salads or when I’m preparing fish or sea food. It does leave you a smelly breath, but the trick my dad swears for is drinking yogurt or chewing few leaves of parsley or mint. Originally from India this aromatic herb comes from the Apiaceae family. 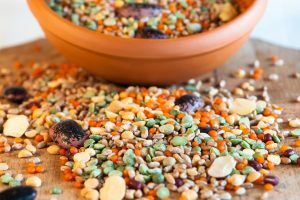 At the beginning it was used in oriental cuisine, but I have to say that Italians have adopted it well and here we use it fresh, dry or the seeds. Both diuretic and purifying, both the leaves and the seeds are used, with which it is possible to prepare an excellent infusion to fight insomnia and to aid digestive processes. 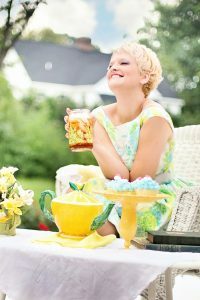 Dill tea can be used by those who want to favor purification and detoxification but also those who try to reduce abdominal swelling and improve digestive processes. Try this Dill tea: take 1 tablespoon of dried seeds or dill leaves needs to be infused into a cup of boiling water for about 10 minutes. Filter is and preferably drink without sugar or add natural sweeteners. Mash 1 avocado adding salt, pepper and tiny bits of fresh dill. Mix well. 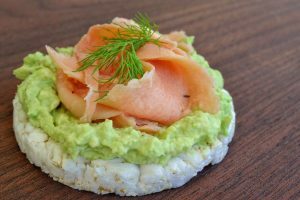 Spread it over rice cakes and add smoked salmon and nice branch of fresh dill on top. 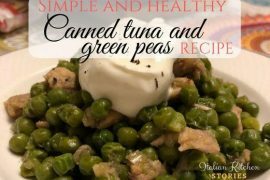 You will have a healthy, protein rich and nutritive snack ready in less than 10 minutes. 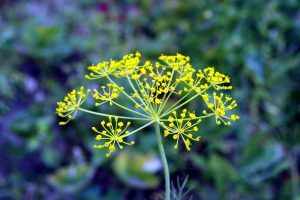 The dill can also be used as a remedy for those who have brittle nails. To improve quality of your nails (both hands and feet) you can prepare a mixture of leaves and grounded seeds and water. Prepare a wraps for hands and feet to give a new strength to your nails. One of the aromatic herbs I have started to use more in Italy is fresh mint. 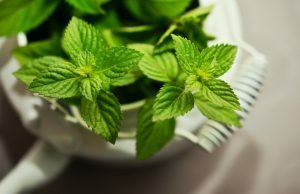 Mint is a perennial and strong herb that grows and develops easily if grown in your own garden or pot, so you can always have fresh and fragrant leaves at your fingertips. It tolerates sandy soils and exposure to full sunlight, which must be counterbalanced by frequent watering. Because of the active ingredients contained in the mint, it is attributed to herbicidal and disinfectant properties. It is useful in case of gastrointestinal disturbances, helps the functioning of the liver and promotes digestion. It contains menthol, vitamin C, natural antibiotics, limonene and isovalerianate. I like to use fresh mint leaves when I’m making a mix garden salad, but also on grilled vegetables. Recently I have tasted fresh mint in stuffed peppers and it was delicious. 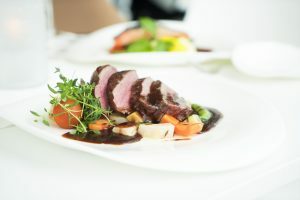 Try to experiments in combining there aromatic herbs in your daily cooking and you will notice you will need less salt. 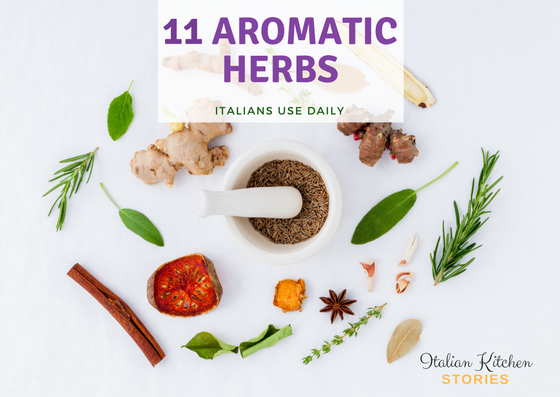 Aroma you will get from each of these aromatic herbs will give a distinct flavors and you will need to use less artificial food flavor enhancers. Which aromatic herbs do you use the most when you prepare your meals?